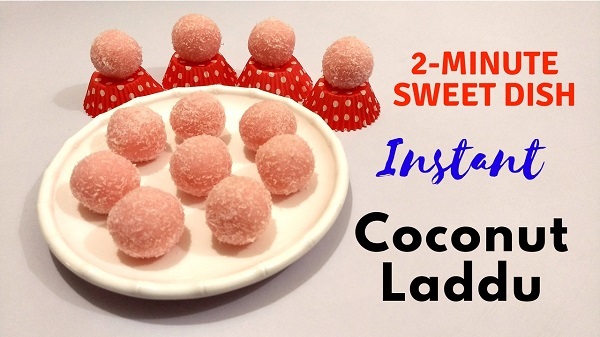 Today I am sharing 2 minute Sweet Dish Recipe – Instant Coconut Laddu. Very easy to make and it requires just three ingredients. If you are in a hurry to make a sweet dish at the last moment, this is a perfect recipe. Try this Instant Coconut Ladoo for Raksha Bandhan / Rakhi Festival. Take 2 cups Desiccated Coconut in a large bowl. Add Condensed Milk and Rose Syrup. I have used Homemade Condensed Milk; you can make it in just 5 minutes, Click Here for the Recipe. 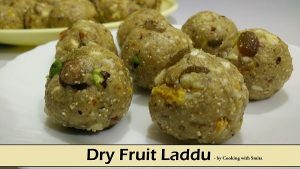 Take some mixture in your palm and make medium or small size laddus. Take ½ cup Desiccated Coconut in a plate and roll the laddus to coat them. Prepare all the Laddus in the same way. You can store this Laddu in the refrigerator for up to 2 weeks.